Fiberglass Insulation - MGT Insulation, Inc.
At MGT Insulation, we proudly install both batt (pre-cut fiberglass panels) and blown-in fiberglass insulation. Fiberglass is long-lasting and can also reduce energy costs and keep your building dry and comfortable all year long. Blown-in fiberglass is a versatile insulation product that can be used for virtually any project. 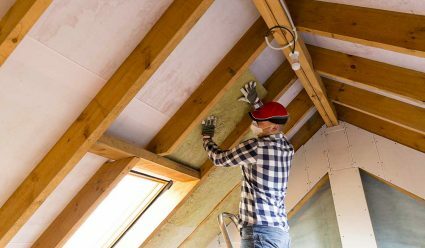 Batt fiberglass is a type of “blanket insulation” that is made specifically to fit between wall studs, attic trusses, rafters or floor joists in existing structures. This type of insulation is commonly found in attics and wall cavities. At MGT Insulation, we may add batt insulation to open wall cavities if it’s the best insulation option. Is Fiberglass Insulation Right for Me? At MGT Insulation, our highly trained professionals conduct a FREE insulation evaluation with a thermal imaging test to determine your home’s energy efficiency. Then, we work with you to decide if fiberglass insulation can meet your needs. We also remove old, unwanted insulation from your home to ensure your house is expertly insulated when our job is finished!